The New Year has begun with more than a few wrinkles that weren't exactly planned for but as I've always thought: "life isn't about what made you fall, but how you figure a way to get back up".... so with that in mind, I trudge on planning for the worst but expecting the best since there isn't much else one can do at this point or at least until "things" begin to settle down. Instead of falling into a "funk", which I'm no good at ever optimist that I am (plus, adversity only makes me try harder), and after realizing that I've done all I can to improve my situation, only then do I sit, take stock and do something else that will make me feel good. For me, this is cooking and especially, baking. I go into complicated and drawn out processes that produce surreal results that takes one back to a special place or time and only make u s long for new travel adventures, but in the meantime a great meal is enjoyed by all. I've also checked out LOTS of books from the library so what used to be a luxury is now an afternoon highlight! So, this morning when I got a call from my sales manager letting me know that due to construction delays my return to work would be, again, delayed for another week..... the "funk" only lasted a second or two before I delved into my travel journals to recall decadent examples of food enjoyed in exotic locations which I can produce in my Twilight Zone kitchen and give me "something to do"....... Usually when extreme comfort food is required (as is the case today), I need "heavy duty" food and the Francophile in me comes out. Since the weather is chilly and lunch time is close, I figured a great soup and sandwich combo seems like just the ticket but "just any old sandwich" would not fill me requirements today. Fast food is not enough, instead Slow Food is a must and I will elaborate..... usually I tend to give recipes for Main Meals yet a day is much more than just dinner, there's still other meals to account for and while breakfast might consist of a croissant and Cafe au Lait or espresso, lunch requires some thought and it is with this in mind that I begin my work in ernest: Slow Food for Lunch. French Onion Soup Gratinee.- The ultimate comfort food for me hands down. You might have another soup that means this much to you but for me this is it. Truly lovely! For the soup: Adjust the oven rack to the lower-middle position and heat the oven to 400 degrees. Generously spray the inside of a heavy-bottomed large Dutch oven with a nonstick cooking spray. Medium-hot heat. Place the butter in the pot and add the onions and 1 teaspoon salt. Cook until the onions are moist and slightly reduced in volume. Stir the onions, scraping the bottom and sides of the pot and continue to cook until the onions are very soft and golden brown, stirring the onions and scraping bottom and sides of pot. Reducing the heat to medium if the onions are browning too quickly. Continue to cook, stirring frequently, until the pot bottom is coated with a dark crust, adjusting the heat as necessary. (Scrape any fond that collects on spoon back into onions.) Stir in 1/4 cup water, scraping the pot bottom to loosen crust, and cook until water evaporates and pot bottom has formed another dark crust, 6 to 8 minutes. Repeat process of deglazing 2 or 3 more times, until onions are very dark brown. Stir in the sherry and cook, stirring frequently, until the sherry evaporates, about 5 minutes. Stir in the broths, 2 cups of water, thyme, bay leaf, and 1/2 teaspoon salt, scraping up any final bits of browned crust on bottom and sides of pot. Increase heat to high and bring to simmer. Reduce the heat to low, cover, and simmer for 30 minutes. Remove and discard herbs, then season with salt and pepper if needed. For the croutons: While the soup simmers, arrange the baguette slices in single layer on baking sheet and bake in a 400-degree oven until the bread is dry, crisp, and golden at edges, about 10 minutes. Set aside. To serve: Adjust oven rack 6 inches from broiler element and heat broiler. Set individual broiler-safe crocks on baking sheet and fill each with soup. Top each bowl with 1 or 2 baguette slices (do not overlap slices) and sprinkle evenly with Gruyère. Broil until cheese is melted and bubbly golden brown around edges, 3 to 5 minutes. Let cool 5 minutes before serving. NOTE: I can also say that a Cream of Tomato and Basil Soup would do nicely too, but for some reason I keep going back to the onion soup most times. Okay, you have the soup but you still need the sandwich part and this can be tricky as not just any old sandwich will do at this point. This is wher e the "Croque Monsieur" comes in. Known as the "most delicious sandwich in the world" to some, I'll give you some variations to be sure you find your favorite too. I hope you will try to make these at least once so you too can see what I mean with these, they are special. 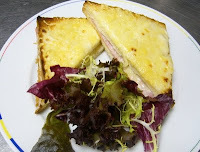 "Croque Monsieur".-The word croque comes from the verb croquer or "to crunch". So a Croque-Monsieur roughly translates to "Mister Crunchy". But this is so much more than that. Of cours e you could always relate to the Monte Cristo (in New York) which I also love and it always surprises me that it's not very popular; the "Francesihna" (in Portugal), a "tosti" in the Netherlands and other versions in Spain as well. Preheat oven to 400°F. Make the béchamel sauce. Melt butter in a small saucepan on medium/low heat until it just starts to bubble. Add the flour and cook, stirring until smooth, about 2 minutes. Slowly add the milk, whisking continuously, cooking until thick. Remove from heat. Add the salt, pepper, and nutmeg. Stir in the Parmesan (if using, I find I don't need it)and 1/4 cup of the grated Gruyère. Set aside. Lightly brush half of the toasted slices with mustard. Add the ham slices and about 1 cup of the remaining Gruyère cheese. Top with the other toasted bread slices. Spoon on the béchamel sauce to the tops of the sandwiches. Sprinkle with the remaining Gruyère cheese. Place on a broiling pan. Bake in the oven for 5 minutes, then turn on the broiler and broil for an additional 3 to 5 minutes, until the cheese topping is bubbly and lightly browned. NOTE: I realize you'll think this is overkill, but do it this way at least once before you decide to make changes, ok? This is a truly decadent grilled cheese and I'm sure you can see many variations you'd like to try. So now you've got the soup and sandwich and are sitting there in heaven. BUT there is still another little detail that's needed in order to fill that hole in your soul- something sweet for a great ending. Since I've been trying to stay busy yet productive I did go a little overboard in today's selections but you'll see why these were chosen. They are spectacular. This recipe was developed for use in a removable-bottom tart pan. You may also use a 9" removable-bottom round tart pan that's at least 1 1/4" deep. To make the crust:Whisk together the sugar, flour, and salt. Add the butter and mix until crumbly. Mix 1 egg yolk with water and orange or lemon zest. Add to the dry ingredients and mix till a cohesive dough forms. Pat into a disk, wrap with plastic, and refrigerate until firm, about 30 minutes. Roll the dough into a circle. Gently ease it into a removable-bottom tart pan, pressing the dough up the sides. Try not to stretch the dough, as this contributes to shrinkage while baking. Use scissors to trim around the top edge, leaving a 1/4" overhang. Refrigerate again, for about 30 minutes. Meanwhile, preheat your oven to 425°F. Prick the crust all over with a fork, then weigh it down with pie weights; or line with waxed paper or parchment, and fill partway with dry rice or beans. Bake for 10 minutes, then remove from the oven and take out the pie weights. Brush the crust with the remaining egg yolk, and return to the oven. While the crust is finishing baking, make the filling; it's important that hot filling be poured into the hot crust. After 5 minutes, remove the crust from the oven, and reduce the temperature to 375°F. To make the filling: While the crust is baking, scald the milk and cream together in a saucepan set over medium heat, or in a microwave. Remove from the heat. Working quickly, mix together the sugar, salt, and cornstarch; add the eggs and vanilla, and whisk until smooth. Pour 1/4 of the hot milk into the egg mixture, then add the egg mixture back to the milk. Pour the hot filling into the hot crust. To bake the tart: Bake the tart for 10 minutes, then turn the oven off and leave the tart in the turned-off oven for 5 minutes. The center will still be wobbly, but the sides should be set. 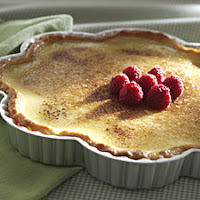 Remove the tart from the oven, and allow it to cool completely. To "brulée" or caramelize the top, sprinkle with sugar and use a chef's torch to lightly brown the sugar, or place under the broiler till sugar is browned, watching carefully. Canele de Bordeaux.- The canelé de Bordeaux (a.k.a cannelé bordelais) is a magical bakery confection, a cake with a rich custardy interior enclosed by a thin caramelized shell. Small enough to eat out of hand, these little cakes have recently gained cachet after years of neglect to the extent that they may one day rival the popularity of crème brûlée in the category of caramelized French sweets. The official recipe, has been written down and locked in a Bordeaux vault. All 88 patissiers in the area have sworn to protect its secrets. This much is known: the general recipe calls for a cold batter to be poured into an ice-cold fluted, tin-lined copper molds, then placed in a very hot oven and baked for a very long time. (In olden times these were placed between the embers of wood fires) After baking, the canelés are firmly tapped out onto a grill while still hot, then left to cool while their exteriors harden. They're at their most glorious one hour out of the oven. Rinse a saucepan with cold water; add the milk; set over low heat; heat to 183 degrees F. Place butter, flour, and salt in the bowl of a processor; pulse until combined. Scatter sugar on top; pulse once or twice to mix. Add egg yolks; process until mixture begins to tighten. With the motor running, quickly and steadily pour hot milk into batter; stop motor; strain through very fine sieve into clean container; press any congealed yolk through; stir in rum and vanilla extract; cool to room temperature; cover; refrigerate 24 to 48 hours. About 6 to 7 hours before serving, lightly brush the interior of each copper mold with lightly warmed white oil; set on paper towels crown side up to avoid pooling of oil in crevices; set molds in the freezer at least 30 minutes before baking. Heat oven to 400 degrees F; Place chilled molds 1 1/2" apart on baking sheet; gently stir or shake batter; fill each mold almost to the top; place on lower oven rack; bake 1 3/4 to 2 hours, or until canelés are deep, deep brown in color, or if desired, almost black. Remove the molds from the oven. Unmold as quickly as possible. To unmold, use an oven mitt to grasp a hot mold; firmly rap the crown side against a hard surface to loosen the canelé; tip out onto a rack; cool to room temperature before serving (about 1 hour); repeat procedure with other canelés while they're still hot (if any canelés resist, bake 5 to 10 minutes longer; OR if necessary, use a toothpick to loosen). Notes: To season new molds: heat oven to 350 degrees F; wash the molds in soapy water; rinse; dry thoroughly; heavily grease the interiors with vegetable shortening or oil; place on sheet tray; place in oven 1 hour; remove from oven; place upside down on a rack; return to oven; heat 15 minutes; turn off heat; leave in the oven until room temperature. After baking, don't wash or scrub the interiors of the molds. To remove baked debris: place the molds in a moderate oven; heat until debris burns; remove debris with paper toweling. Store lightly oiled molds in a cool c overed place. To make "white oil": Place 1 ounce round of bee's wax in a 1 pint glass measuring cup; melt in a microwave; while still warm, gradually stir in enough safflower oil to make a whitened mixture, light enough to coat the back of a spoon); cool to room temperature; store in the glass container at room temperature. 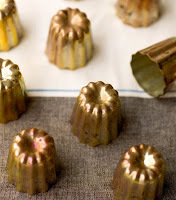 To coat pre-seasoned canelé molds with "white oil": use dabs of warmed oil to coat the interior and shake out excess. Parisian culinary equipment store Culinarion (011-33-141-90-09-11; "http://www.culinarion.com/" Culinarion carries only one size, the three-ounce capacity mold, because it is the only one that is "politically correct. Beeswax can be ordered from "http://www.jandnsales.com/"
Note: You can substitute Nordic Ware's mini-bundt molds available at "http://www.cooking.com/". You will not need to use the "white oil. (I use silicon molds so I don't need the oil but I should use the true molds (some day maybe). Too much information? Maybe. OCD? But of course! Lol..... anyhoo, it seems to help and the results I can guarantee are worth it, every time (just ask my guys...) and while I don't know what I'm making for dinner yet (Rene has hinted he'd like "Asado de Boda Zacatecano") but I'll worry about this a little later. Do I spent too much time in the kitchen? You bet! H ours upon hours sometimes, going from one project to another like a little production line... making variations on a theme, sometimes as I work I begin with one plan and end up with something different, but always worth the effort. The trick to be able to do this is of course to be willing and second is to have a full pantry of basic items and then some so when inspiration hits you don't have to leave everything to make a trip to the store (which tends to dampen spirits and take you on tangents you might not have thought of before....lol). Just have fun and enjoy it!